Little Clara came into this world on April 2, 2016, arriving at only 28 week’s gestation and weighing only 2 pounds 1 ounce. Clara’s mother had preeclampsia which caused the doctors to perform an emergency C-section. Clara was immediately rushed to NICU and placed on CPAP (continuous positive airway pressure) through the first night. It was clear she needed further help breathing so they put her on a ventilator for 8 days. After her time on the ventilator she went back on CPAP at the highest pressure (assistance) setting. CPAP is a treatment that uses mild air pressure to keep the airways open, while allowing the child to take their own breathes. Around 12 weeks later, Clara had not shown much improvement from the various treatments being done, so doctors ran a CT scan and did a lung biopsy. The conclusion was that little Clara had a rare lung disease called Pulmonary Interstitial Glycogenosis (PIG). PIG is so rare that only 3 in one million children are diagnosed with it. It is caused by an abnormal accumulation of glycogen in specific cells of the lung. There is a space between the air sacs in the lungs that is vital, but with the glycogen build-up, those sacs are unable to work properly. The result is not enough oxygen in the bloodstream. After 115 days in the NICU and around the clock treatments, sweet Clara was finally well enough to go home with her family and be in her own bedroom, prepared just for her. 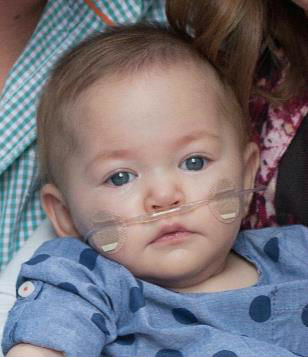 Now at 7-months-old, it is vital for Clara to be on continuous oxygen. She receives various treatments to strengthen her lungs, and she will continue to be monitored. With the right care, the prognosis is very favorable for her lungs to grow strong and healthy. Clara is a precious sweet baby girl, who is the daughter of two very proud first-time parents. She lives in a home filled with love and great care. Clara will be adopted as a Sparrow to Hedrick Middle School. Students at HMS will work hard to raise money for sweet Clara through sponsored community service and fundraising projects.